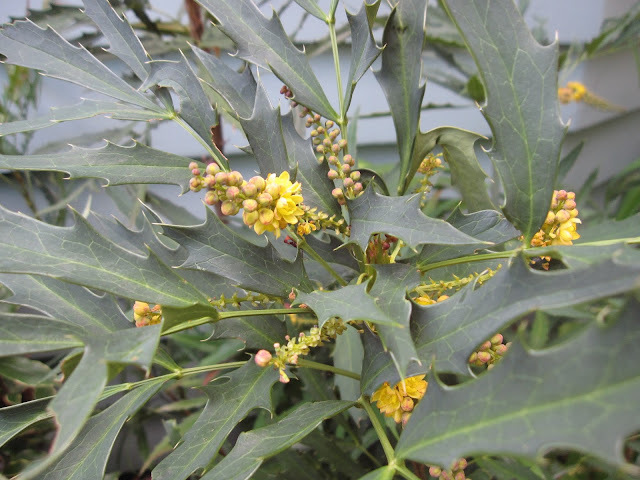 Dan Hinkley Chinese Mahonia is a Xera Plants introduction, from cuttings furnished to Xera Plants by the renown plantsman Dan Hinkley from his plant-hunting expeditions in China. 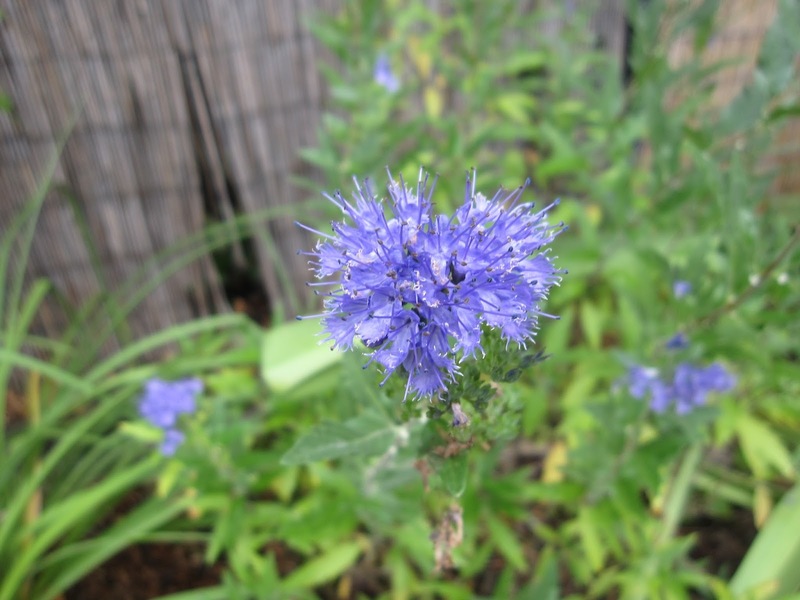 I have been enjoying this favorite plant for much of the month; it's been blooming for weeks in my garden. I was thrilled to get my Mahonia fortunei 'Dan Hinkley' from Xera Plants at the 2012 Portland Yard, Garden & Patio Show. 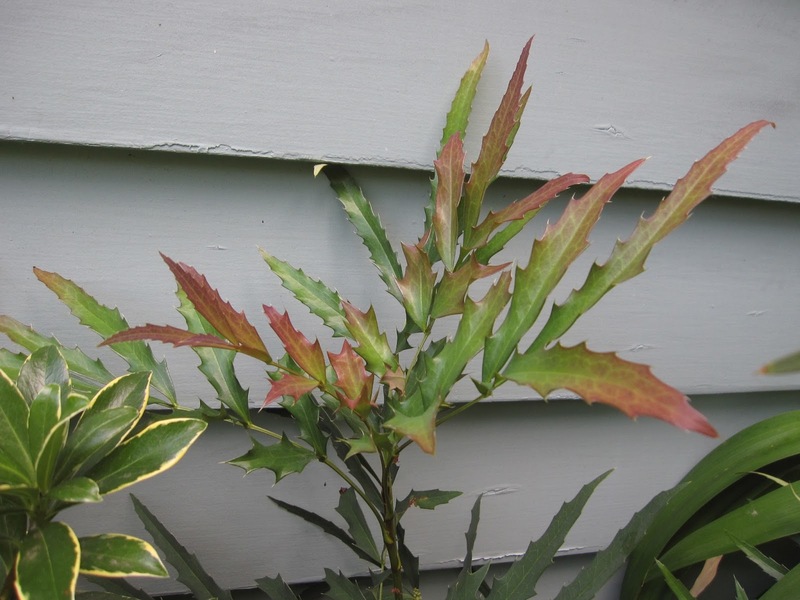 Like many Mahonias, the new growth is a lovely, bronzy-red color. 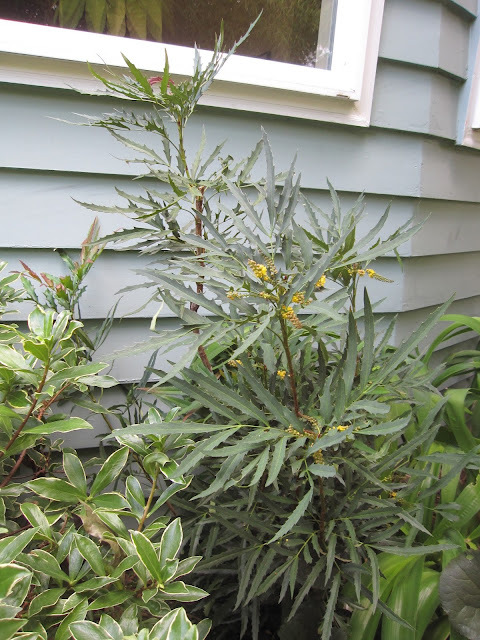 Our view of 'Dan' was further enhanced (maybe I should say exposed) by the recent removal of a mature Daphne odora 'Marginata' you can see to the left in the shot above. 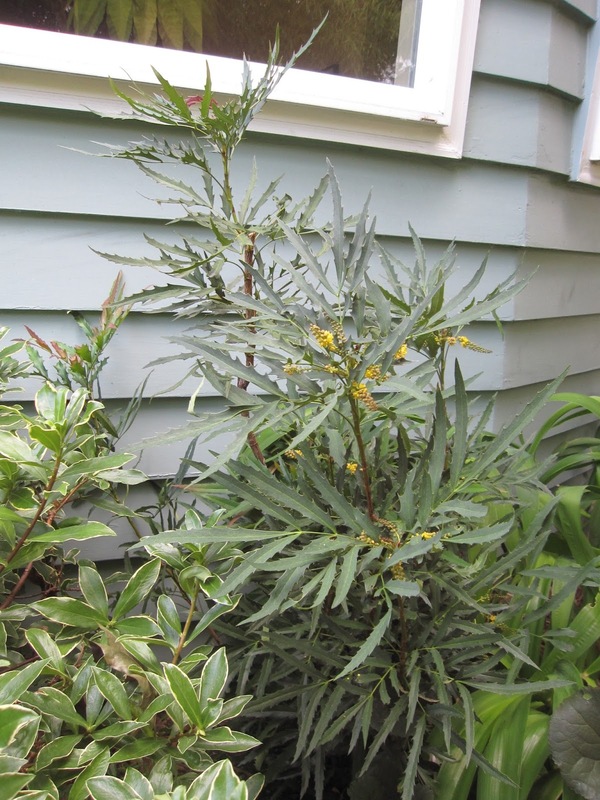 Although the Daphne enabled the Mahonia to get a good start by shading its roots, it had outgrown its space and had to go. I'll need to shade 'Dan' and his roots with something else this next summer. I had a hard time getting the picture above; as you can see below there's a muddy channel where I usually walk. And the mud is because our much-anticipated patio/path project started this past Monday, after a month of delays created by the summer heat: the concrete contractor couldn't pour in the over-90-degree temps, so he got backed up on all his prior projects. 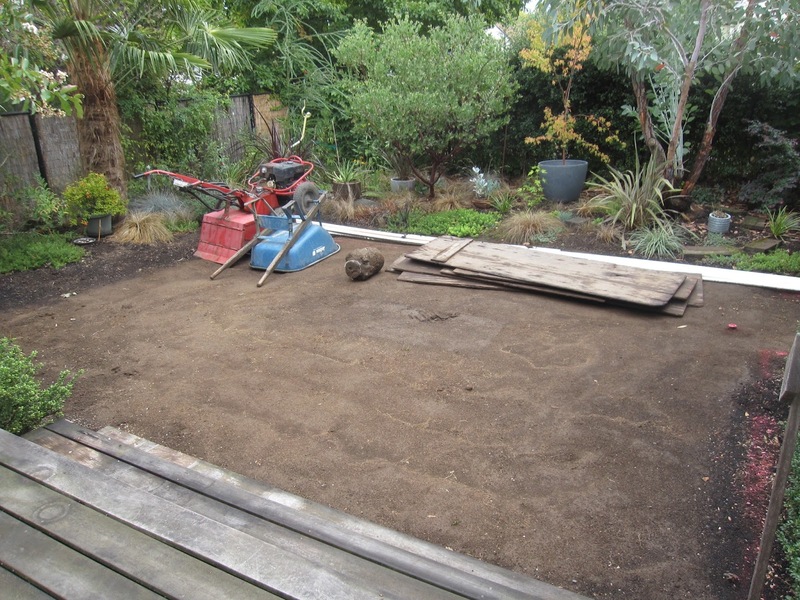 Rather than have our project stall halfway through, we asked our contractor to delay his start until the concrete guy was available to do his part. 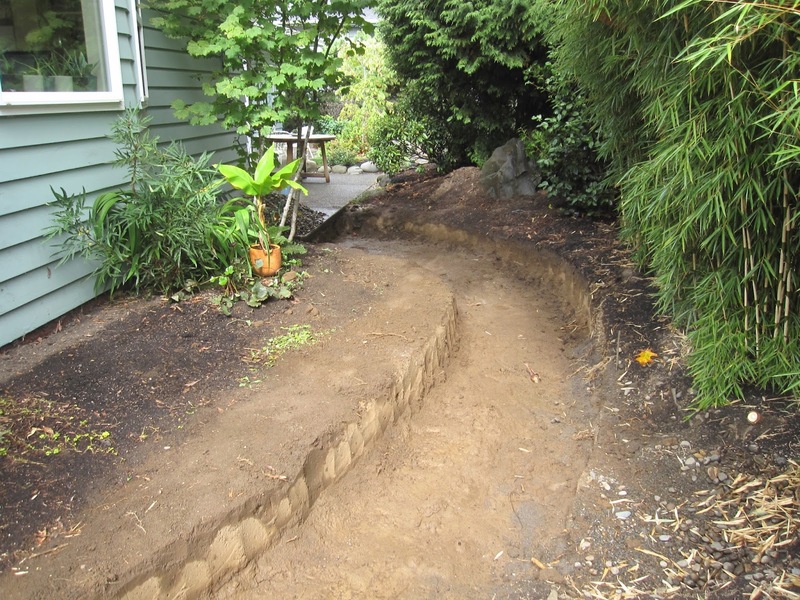 Although there's been no work for the last two days, I'm encouraged by the project beginning. And if it gets too grimy and grim, I'll just spend some time researching other garden bloggers' favorite plants: My post is part of the end-of-the-month roundup of garden favorites hosted by Loree over at danger garden. Check out the rest! Summer feels over. I'm already missing the long, warm (okay, hot!) days we've left behind. 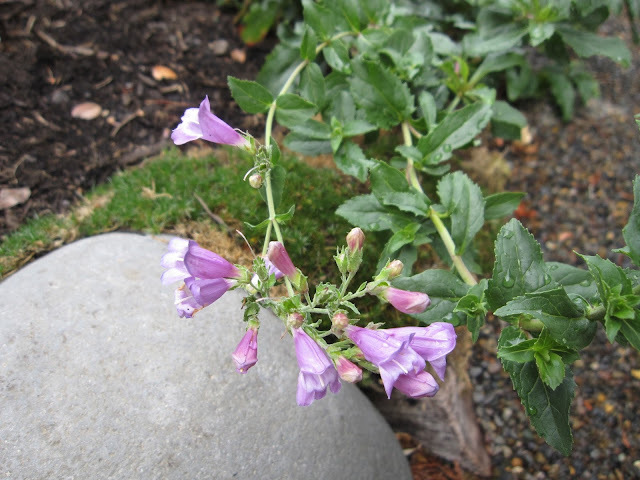 Luckily, as of yet my garden hasn't gotten the message and is still pumping out blossoms for this month's Bloom Day. 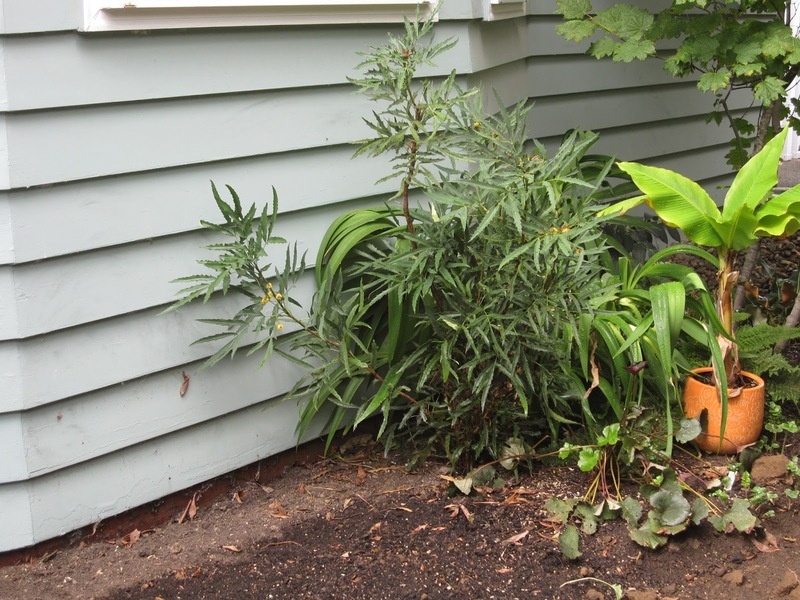 With some significant perennials missing due to being lifted for the yet-to-begin(!) 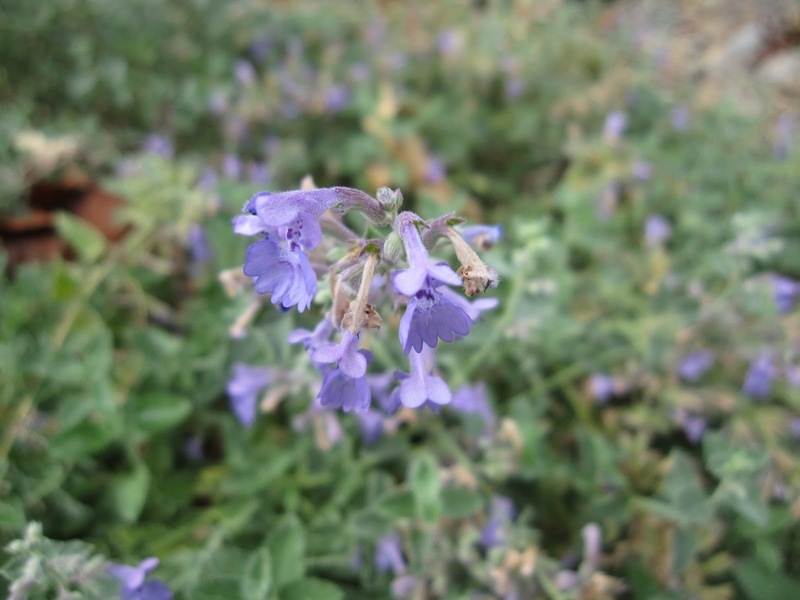 patio project, here's what's blooming today, and still blooming from August at Longview Ranch. 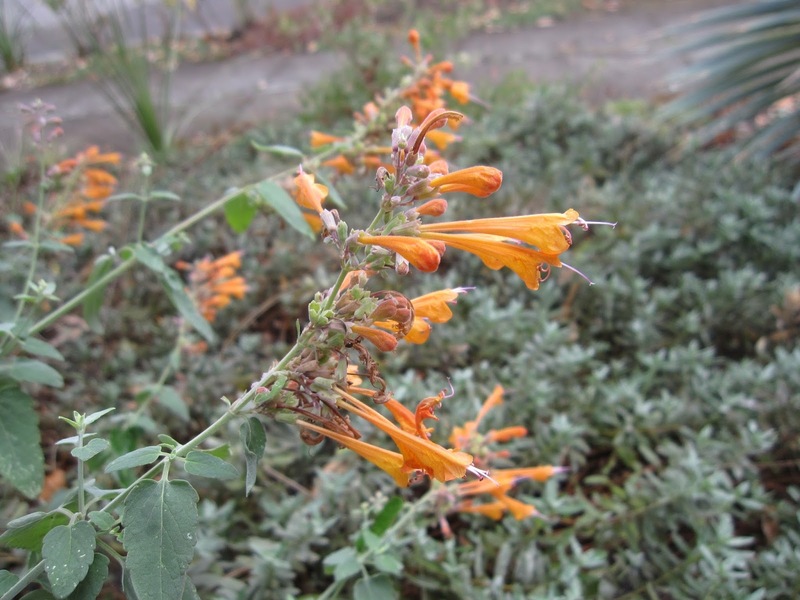 Agastache 'Apricot Sprite' just doesn't quit, although I found I do have to give it more water than I expected. That orange makes it well worth the extra moisture. 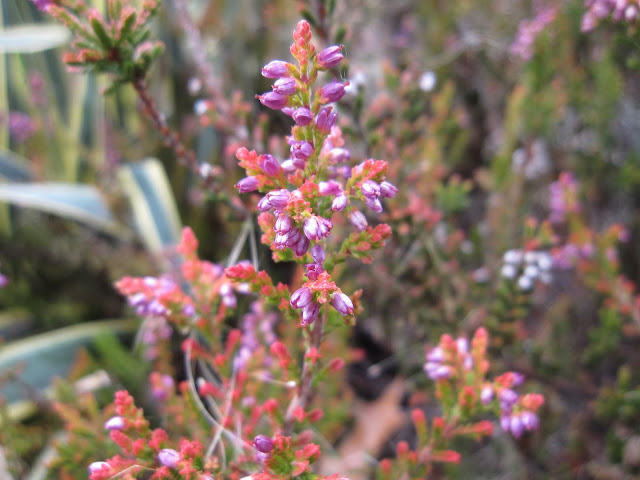 I love the way the pinky-purple blooms of this NoID summer-blooming heather combine with its orange new growth. Up close it's a little odd, but at a distance the effect is warm and delightful. 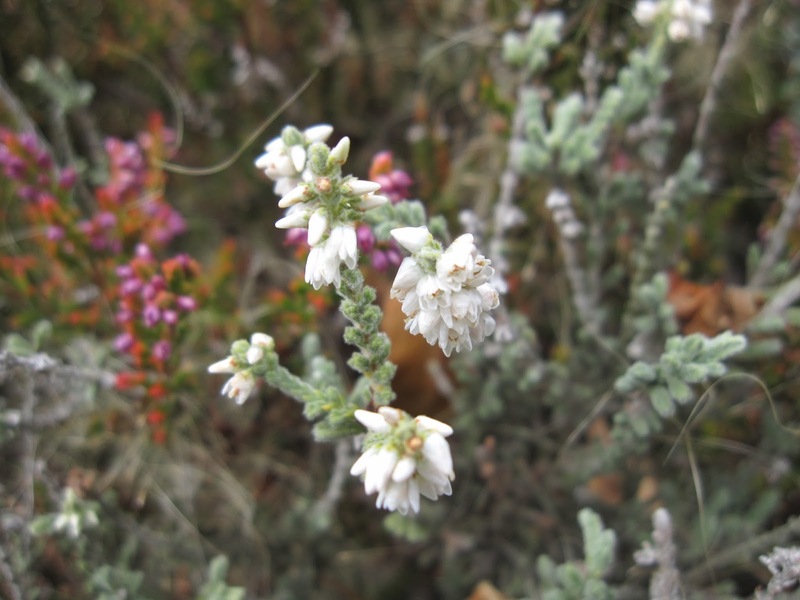 Right next to it, this white heather with gray foliage cools down the scene. 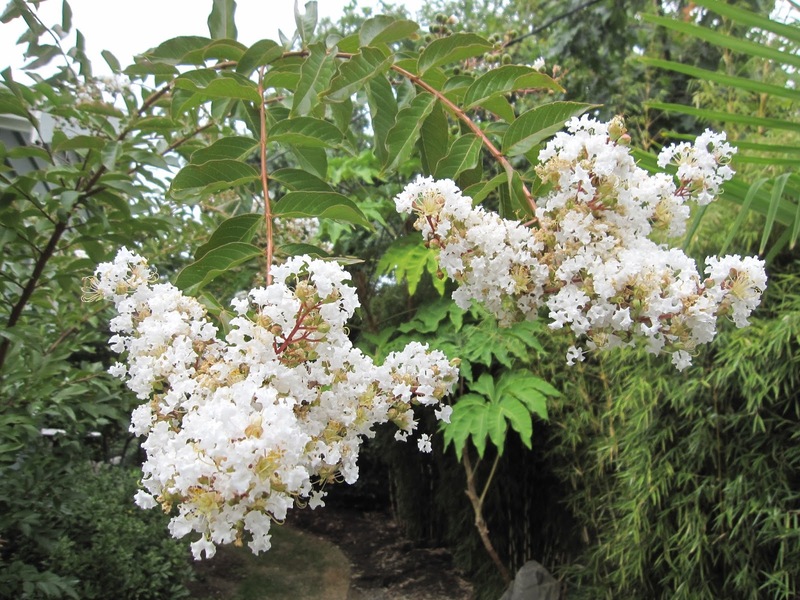 Another white in the garden is the Lagerstroemia 'Natchez', still blooming well from last month. 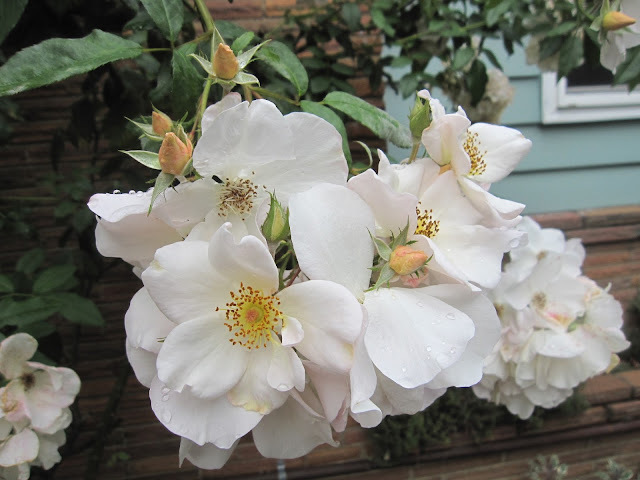 Rosa 'Sally Holmes' is having another flush of bloom. As many of you know, it's one of only a few roses I grow affirmatively, but I love these little apricot buds that open to simple white flowers. 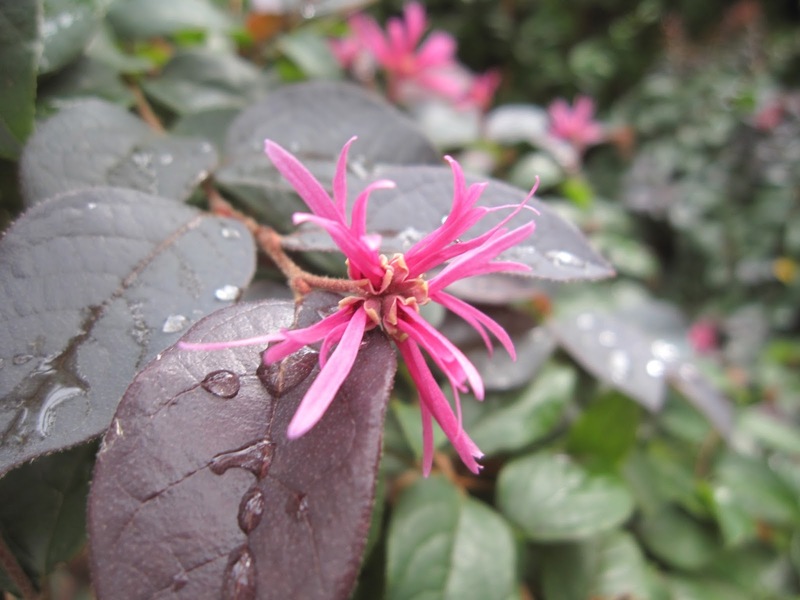 Loropetalum chinense 'Sizzling Pink' is responding to cooler days and more water. 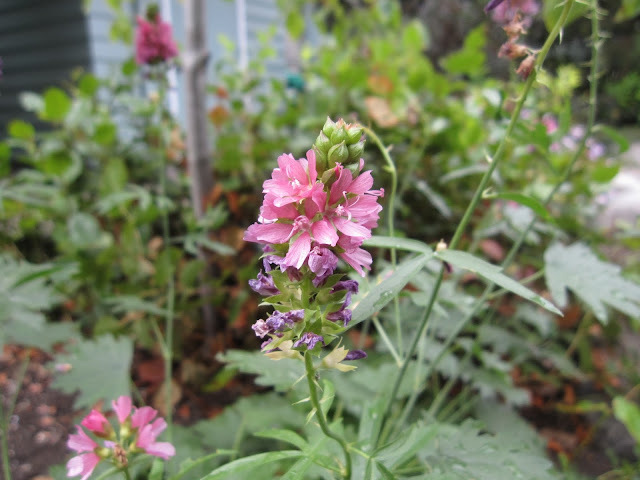 Sidalcea oregana, Oregon Checker Mallow, is coming back after a chop. 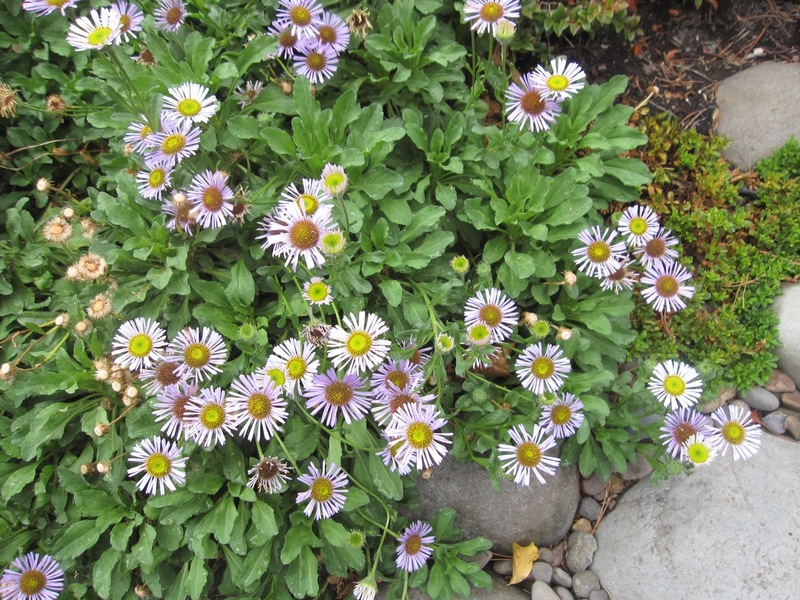 The pale blooms of Erigeron glaucus brighten up the Northwest Territory. 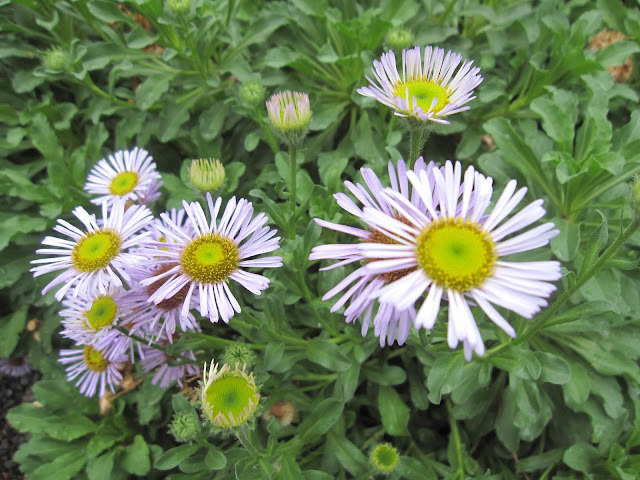 Their soft lilac coloring is difficult to capture; this is pretty close. In contrast, here's an eyeful hanging over from my neighbor to the north. 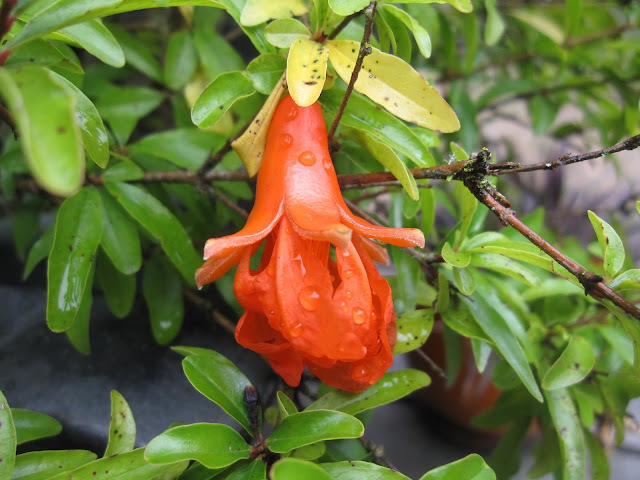 Smaller, but equally intense in color are the remaining blooms on Punica granatum. The hummers still check them for nectar, but I have no idea if they get rewarded. Tiny blooms are forming on some prostrate Rosemary in barrels along our driveway. One of the perennials far back in its bed so not needing to be lifted, this Caryopteris punches out a few blue blooms. 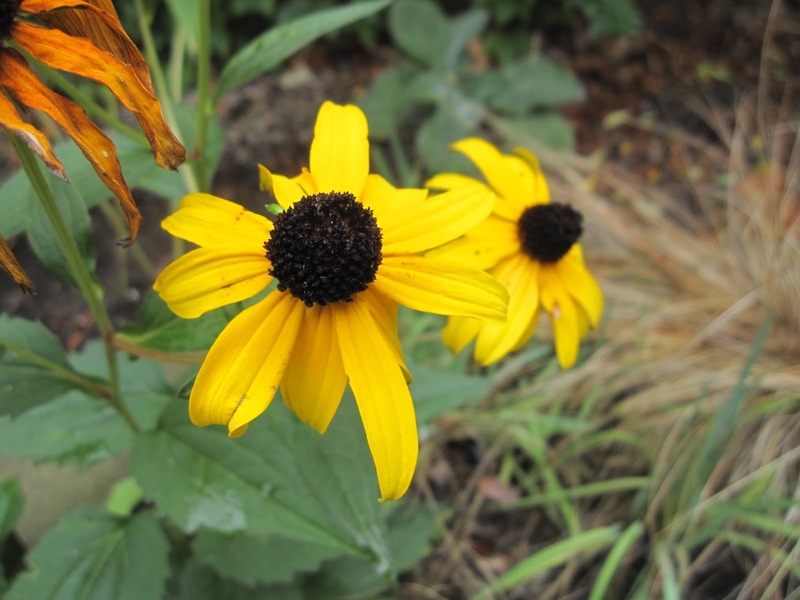 Rudbeckia would like more sun, but is shining forth anyway. 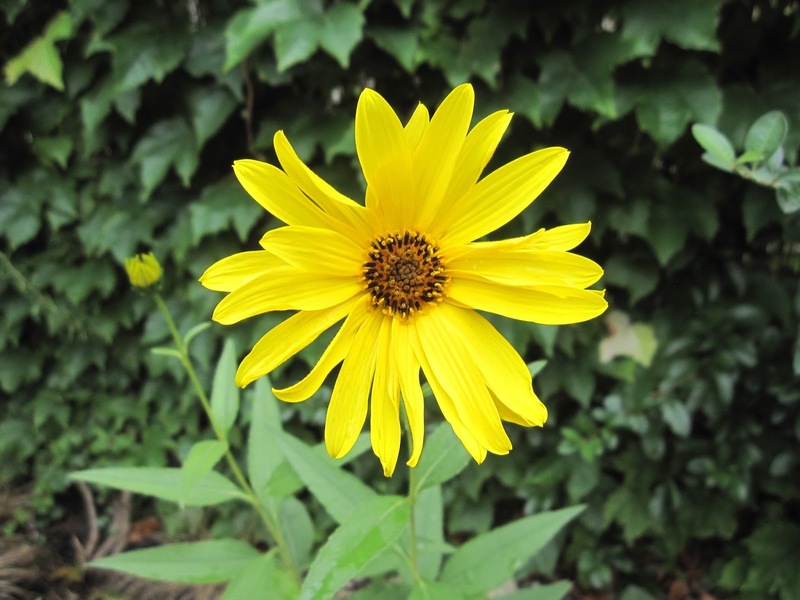 My first bloom of Helianthus maximiliani, courtesy of Ricki at Sprig to Twig. 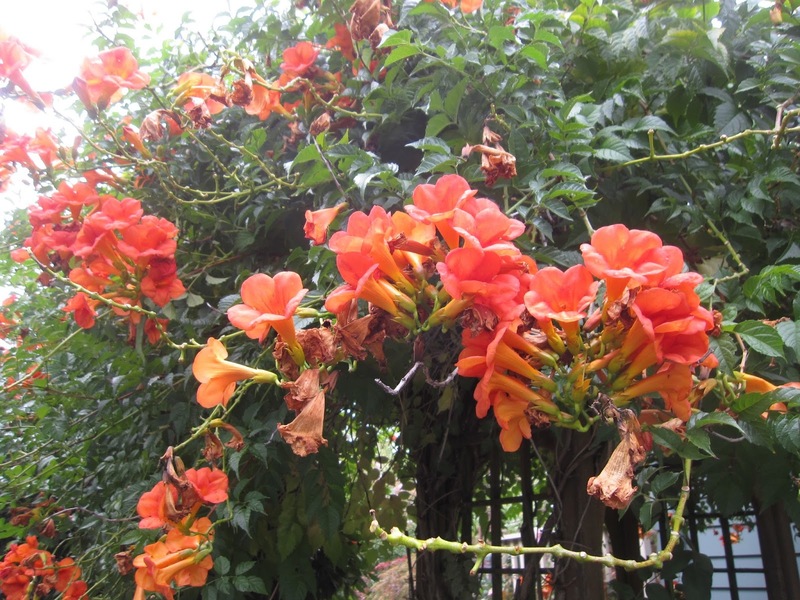 Bloom Day is sponsored on the 15th of each month by the lovely Carol, at May Dreams Gardens. Check out the links there for blooms everywhere. I was at Lan Su, the Portland Classical Chinese Garden again last week (no surprise - we seem to go there weekly), where I took this shot looking through a scallop cutout in the wall. 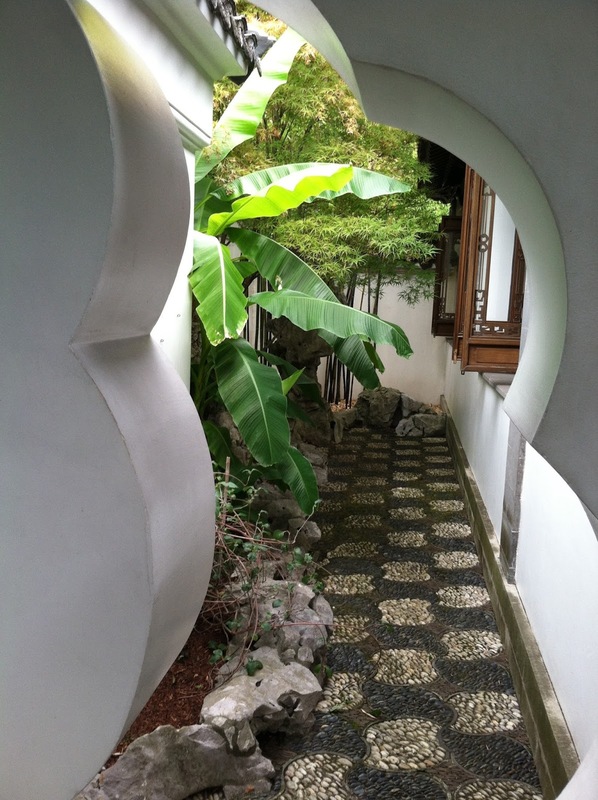 I have always been intrigued by Lan Su's small, walled courtyards with no visible means of entry. It's all about the view from here, but doesn't this one beckon to you, too? 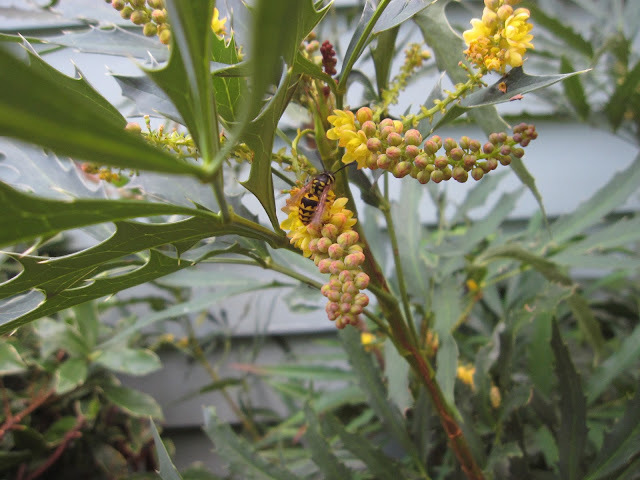 Wednesday Vignette is hosted by my friend Anna, at Flutter and Hum. Take a look over there for more intriguing and lovely ways to observe our world today.